At 540 grams, these are the world's lightest waterproof saddle bags. 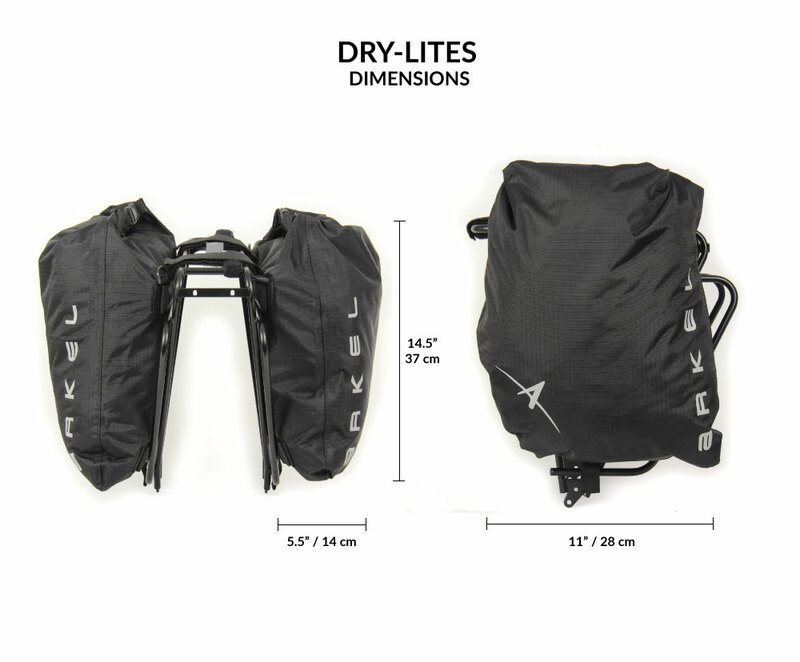 NOTE: Arkel's Dry-Lites are built for lightness and performance. The lifetime warranty still applies, but wear and tear and resistance to impact is less than with Arkel's heavy-grade products. Below: Dry-Lites paired with the Arkel Tailrider sold separately.
" I had the pleasure of testing the Dry-Lites in the perfect setting. The French "Route des Grandes Alpes" from Nice to Albertville is the exact terrain and conditions these fully waterproof and featherweight bags were designed for.A full set of evening clothes, including light shoes, rain gear, warm jacket, tablet all fit in the Dry-Lites. The rest of the quick access stuff and the occasional bottle(s!) of wine, fit in the perfectly matching TailRider trunk bag. Coupling the TailRider with the Small Handlebar Bag to carry my SLR camera, was all I needed to ride the challenging route across the Alps. We stayed in small hotels along the way. On day loops, we left either the TailRider or the Dry-Lites at the hotel depending on weather. In short, the available volume combined with the feather weight of the Dry-Lites truly make them the Formula One of bike travel bags." Paul, Arkel Owner and long-time cycle tourist. My bikepacking setup still utilizes a rear rack, which makes me an anomaly in the new age of gravel grinding adventures. Originally chosen for their price point, these panniers have quickly become the favorite part of my setup and perform flawlessly on everything to rough single track. Ample room for multi-day trips worth of gear and food, streamlined design, non-plastic mounting hardware, and the light weight means that after 2000+ km's with these things, they are by far the best alternative to expensive seat-packs.